Our relationship at this Mission Critical complex in the Chandler Technological Corridor spans many years with multiple owners and renovations. This particular site holds two buildings totaling 175,000 square feet and a separate parking structure. Total construction included a call center, followed by the shell then the complete build-out for the upgrade and renovation of the 12 MW Tier III data center - all completed ahead of schedule in just 13 months. This Design Build project utilized one of the first 6D levels of BIM. This 180,000 square foot, two-story shell was remodeled and expanded 59,000 square feet to accommodate 800 employees in a data and call center environment. Electrical scope included major data server, uninterruptable power supply and a large MDF room for the required fiber runs. 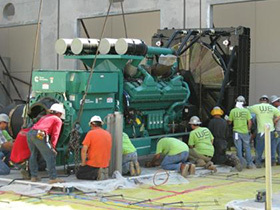 The site has two 1500 KVA generators for backup power. Early integration of our construction team in the Design-Assist process delivered the project within the fast-track schedule and under budget. 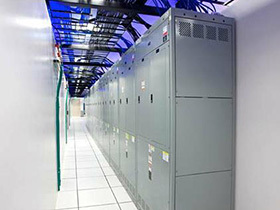 15,000 volt UPS (uninterruptable power supply) systems are not commonly used but provide a stable, reliable power source for this multi-user data center. The initial design called for two 13.8 kV UPS systems, each rated 2.5 MVA/2.0MW expandable to 12.5 MVA/10.0 MW each by adding four 2.5 MVA UPS containers to each system in the future. Our relationship with GoDaddy is very unique. 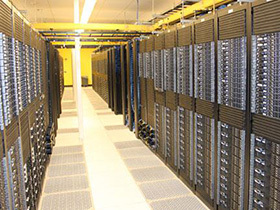 We started working for the internet giant almost 10 years ago when they were converting an existing facility into a 300,000 square foot regional data center. The expansion and renovation was divided into seven phases over six years, from 15,000 square feet to 90,000 square feet. Each phase focused on upgrading the multiple generator units, paralleling switchgear, and uninterruptable power supply operating each server room. Currently, we still provide ongoing maintenance at the facility and execute equipment upgrades as needed. To date, GoDaddy has never experienced an outage while serviced by Wilson Electric.